All the other pets have more toys than me! 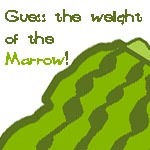 Guess the Weight of the Marrow! Keep your personal info to yourself!